First Department of Internal Medicine, V. I. Lenin Kazan' Postgraduate Medical Institute. Laboratory of Biophysics, V. I. Ul'yanov-Lenin Kazan' University. 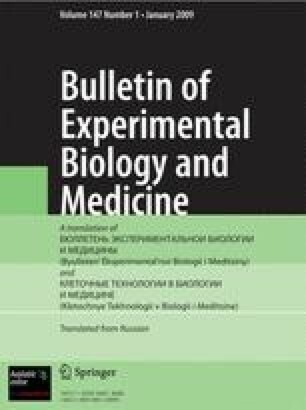 (Presented by Academician of the Academy of Medical Sciences of the USSR, A. A. Vishnevskii.) Translated from Byulleten' Eksperimental'noi Biologii i Meditsiny, Vol. 77, No. 5, pp. 50–51, May, 1974.